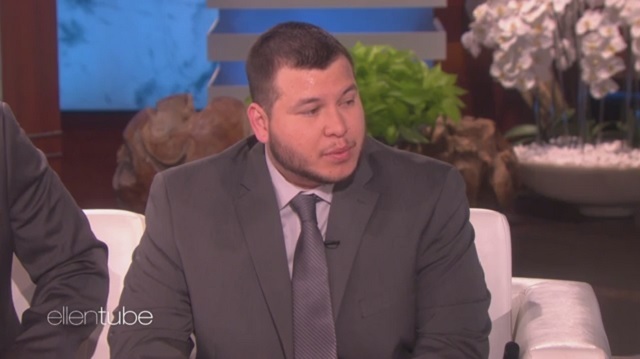 Las Vegas security guard Jesus Campos, who went missing before his scheduled appearance on Sean Hannity's show last week without explanation, reappeared Wednesday on Ellen for what he said would be his one and only interview on the attack. Here's the full interview, he was joined by building engineer Stephen Schuck. The whole interview was rather strange. Perhaps the most odd part was towards the end where Ellen spoke for him saying it's going to be the only interview he ever gives because he just "wants this to be over." "You're talking about it now and then you're not going to talk about it again," Ellen said. She didn't ask him why he went missing. She didn't ask why he canceled his other interviews, where he went, whether or not the reports he checked into a "quick clinic" were true. She basically just walked him through "his" own story. No one appears to be satisfied with the incomplete explanations we're getting.